Nature Moments is a weekly series of short videos designed to showcase the natural history of common plants and animals. If you live in eastern North America, you will be able to find almost all these species. The videos are being filmed as the seasons change in my backyard in Brunswick, Maine, with photography by Wilder Nicholson and me, editing by Wilder, and additional help from Genie Wheelwright, Tom Porter, Paul Benham, and Rebecca Goldfine. If you want to make your own natural history observations, The Naturalist’s Notebook by Nathaniel T. Wheelwright and Bernd Heinrich (Storey Publishing, 2017) provides guidance, a systematic format, and a five-year calendar journal. Bernd and I are donating 100% of all royalties from the book to conservation and environmental education. Note that you can sort and view the videos by month, season and taxonomic group. Read more about The Naturalist’s Notebook: Making Everyday Connections to Nature through Journal-Keeping. Thank you for letting me share a year of nature in my backyard. The entire Nature Moments series may be used for free by anyone, anytime for the purpose of spreading enthusiasm about nature. Special thanks to Bowdoin College, Maine Audubon, the Davis Conservation Foundation, friends and family who starred in the videos, and our fabulous team: Wilder Nicholson, Tom Porter, Rebecca Goldfine, Paul Benham, and Genie Wheelwright. Whip-poor-wills, swallows and other birds that feed on flying insects are rapidly disappearing throughout the northeast. The same is true of too many other animals and plants. Once you pay attention to nature and come to care about it, you can hear the loss of species in the deep heart’s core. It sounds like this. How can so many frog species co-exist in the same pond without competing for food or accidentally mating with the wrong species? One solution is to reproduce at different times of year. From mud season until the first autumn frosts, you can witness a parade of different frogs. 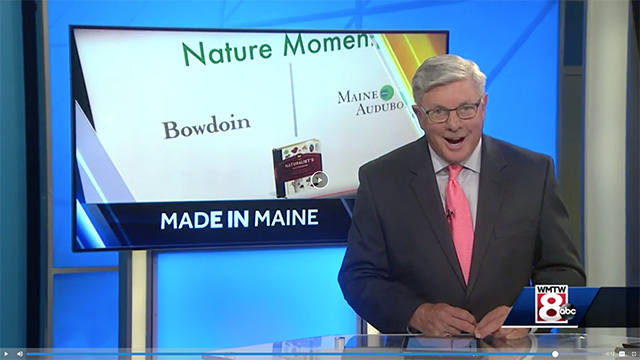 The yearlong Nature Moments video series was recently featured on local ABC affiliate WMTW’s “Made in Maine” series, hosted by Steve Minich, and on Maine Public Radio’s “Maine Calling,” hosted by Jennifer Rooks. Those holes, rips, folds and tubes that you find in leaves? They’re mainly the work of larval beetles, moths, flies, sawflies and other insects. In moderation, herbivory is a sign of a healthy environment because it indicates that our native insects have not been decimated by pesticides or climate change. Animals like painted turtles use different parts of their bodies to send distinct messages. Backs and bellies are designed to mislead predators, while faces, with their fine details, advertise a turtle’s identity and quality to nearby competitors and mates. As soon as the ice melts from ponds, wood frogs emerge from hibernation, filling cool spring nights with the sound of their croaks. To tell males from females, just look at their hands. Males have absurdly muscular thumbs, the better to hold onto females in the fierce competition for mates. In February, when it’s still frigid at night but daytime temperatures are starting to warm, it may look like trees are just sitting there doing nothing. But inside their cells, changes are happening and sap is starting to flow. Why is it so maddeningly difficult to keep squirrels off birdfeeders? After all, they’re just rodents with brains the size of a ping-pong ball. Squirrels are such amazing problem-solvers because they’re observant, social, experimental and persistent. Have you ever wondered what could be living underneath the ice of a frozen pond? With no light or air, and temperatures just above freezing, you’d think life would be impossible but…. Plants may not move as quickly as animals, but check out the “behavior” of rhododendron leaves when it’s frigid. Their drooping and curling help prevent damage from excess light when it’s too cold to photosynthesize. What animal can jump 100 times the length of his body — without using any of his six legs? Take a walk in the snow on a sunny February day and look closely in your boot prints. Gulls are extraordinarily variable in the way they look. The color of an individual’s plumage, legs, and eyes reveals not only what species it is but also its age, condition and social status. American beech is actually easier to identify in winter than in summer, even at 60 mph, because it holds onto its dead leaves all winter. The reason? The ancestors of beeches evolved in the tropics where plants photosynthesize year-round. Beeches just happened to keep a tight grip on their leaves when they moved north. You can find lycopods (aka clubmosses) growing on the ground in most northeastern forests. They are the only living descendants of ancient lineage of towering trees. And they have a special talent: their oily spores are amazingly flammable, perfect for DIY holiday fireworks! Most mammals are only active after dark, so it’s harder to get to know them than, say, birds, which are active and conspicuous during the day. But you can figure out how mammals like white-tailed deer spend their time by noticing subtle signs of their behavior. Have you ever taken a close look at mosses? They’re simply elegant, and you can find them almost anywhere. They’re not that hard to tell apart especially with Ralph Pope’s moss field guide, so why not get to know them? Why do leaves change color in the fall? I asked Bowdoin College Biologist Barry Logan that question. It turns out that the answer depends upon what color you’re talking about. Who knew that red acts like a leaf’s sunscreen? Gender in humans turns out to be more complicated than we once thought, but gender in plants is pretty complicated, too. Plants can have separate sexes, like most animals, or they can be hermaphroditic — but in two different ways. Next time you pass a flower, check it out! Would You Put This Stuff on Your Lawn? You’d have to really hate butterflies, beetles and bugs to spread insecticides all over your lawn. Take a closer look at the ingredients and cautions on the package — you may decide not to use it, and share your lawn with other living creatures instead. Have you ever wondered what would happen if you didn’t mow your lawn for a while? When I tried that, three dozen different flower species appeared, providing a banquet for insects and birds.